Week 21 – Life hacks, time savers, and a gift that might belong to you! Earlier this year, I shared the story of learning just how easy it could be to refill the soap dispenser built in to our kitchen sink. As a result, I received lots of replies from people who were grateful to know they no longer had to crawl under the sink . In the spirit of sharing good news, I thought I’d offer a few more tips and one great product I’ve found that I think you’ll love. First of all, one of my readers responded to the soap dispenser story with her own discovery. Did you know that at the ends of the boxes that contain plastic wrap rolls (or aluminum foil, which I don’t like to use) there are indentations you can push in to hold the roll in place so it flows better? I had no idea and now it’s smooth sailing! Second, if you didn’t watch the video about how to put a duvet cover on a comforter all by yourself, do yourself a big favor and watch it here. Since I posted the video I’ve tried it and it works like a charm! Third, I’m a Mac user and one of my all-time favorite tips has to do with viewing files. Did you know that you can highlight any file on your desktop or in the file finder, hit the space bar, and view what’s in the file without having to open the program it’s related to? I’m not sure if it works on PCs (let me know!). Go ahead and try it. It’s such a timer saver! Okay, my last tip is the product I’ve found. First let me say right up front that I don’t have any financial interest in this company nor am I an affiliate of any kind. I just like to share the things I love and appreciate. I’ve always been interested in new technology that brings greater ease to life and I’m committed to using natural, non-toxic cleaners, so when a friend told me about a company called Force of Nature that combines both, I paid attention. Using a small appliance (approx 4”wide by 10” tall), ordinary tap water, and a capsule containing a precise solution of vinegar and salt, this little machine produces electrolyzed water that becomes a safe and powerful disinfectant that’s currently used in hospitals in both the U.S. and Japan. It’s so powerful that it’s effective against the viruses that cause colds & flus, MRSA, E.coli & Salmonella! 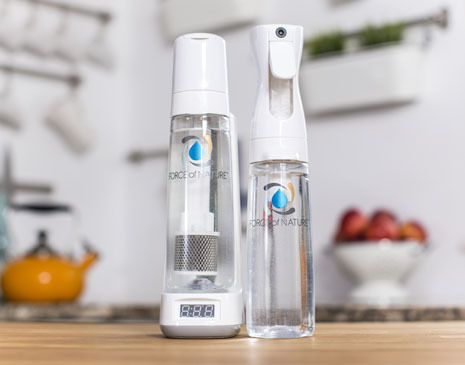 The electrolyzed water kills 99.99% of germs, eliminates mold & mildew, and it makes odors vanish instantly. To be honest, it sounded a bit miraculous at first, but figuring I had nothing to lose by trying it, I went ahead and ordered a starter kit. Not only did it disinfect my bathrooms and kitchen counters, it cleaned our stainless steel appliances (without leaving any streaks) and the glass cook top of our electric stove. This made me happy because I don’t like having to buy toxic, special cleaners for both. The next amazing thing was how it immediately eliminates odors. The company advertises that it’s great on kid’s sports equipment and since I don’t have kids, I tried it on the inserts of a friend’s running shoes. We had to smell them beforehand to do the test (and trust me, it wasn’t pretty), but after spraying both sides of the inserts with Force of Nature, they were completely odor free. Now it’s pretty much all we use around the house. I’ve even used it as a hand sanitizer because it’s completely nontoxic (which means you could lick your hand after using it – although I don’t recommend it ). Knowing I wanted to write about the product, I contacted the company and asked them to offer five free starter kits to my community and they agreed (smart peeps!). So here’s what I thought we’d do: Leave a favorite tip of your own on myFacebook Page and I’ll choose five people at random on Monday night to each get a kit. Just as sweet, we’ll all be winners, pooling our collective wisdom! Be sure to check the Facebook Page on Tuesday morning to see if you’ve been chosen (and to read the great tips)! A big thank you to my friend, Kelly, who had no idea what I was going to write about this week, and sent this video that’s perfect for sharing household tips. You can watch it here.